What surprises me about 500 Years of Protest and Liberty: From Martin Luther to Modern Civil Rights is that it says nothing about Sunday laws. I anticipated that a book written by an Adventist for Adventists about religious liberty issues would have a primary focus on Sabbath Observance and the threat of Sunday laws in the context of end-time events. Such is not the case here. Nicholas Miller, a professor of Church History at Andrews University, has published a book on religious liberty through the Pacific Press that moves beyond the traditional, almost exclusive, Adventist concerns with Sunday laws and coerced worship. Professor Miller mentions Sunday laws not once in his 192 pages, although in one brief paragraph he alludes to a 1997 case about the liberty to observe Sabbath free of work for a prisoner in Indiana. He follows this up with a brief discussion of the free exercise of religion in the context of prisons and efforts to implement the Religious Freedom Restoration Act (RFRA). There is also the briefest of allusions to coerced worship on the last page of the book. The scope of Miller’s book is much broader than Sabbath-Sunday issues. The book deals with the historical and philosophical background to the development of the present state of religious liberty in the United States and the more pressing contemporary issues that Miller perceives as posing a serious threat to full religious liberty. The topics he feels it important to address instead of Sunday laws is testimony perhaps to the diminished role that such laws play in the changing world in which Adventists find themselves 150 years or so after their founding. Published in late-2017, the occasion and timing of the book is linked to the 500th anniversary of Martin Luther’s publishing of his 95 theses in Wittenberg. Miller sees a direct link between the sixteenth century Reformation and the Civil Rights movement led by Martin Luther King, Jr. culminating in his march on Selma, Alabama. “Did the Protestant Reformation play any positive role in the development of human rights in the West?” is the question with which Miller begins his enquiry (17). The specific ideological connection he sees between the two movements is between Martin Luther King, Jr.’s concern for the brotherhood of humankind and the corrosive effects of materialism, and the sixteenth century German monk’s vigorous attack on “a corrupt system of finance, power and spirituality.” It was the attack of Luther on financial abuses, Miller argues, which actually brought the religious issues of grace and law, justification by faith, the priesthood of all believers and the brotherhood of man, along with the central role of scripture to the front and center of attention. Thus the sesquicentennial celebration of the sixteenth century Reformation is an appropriate occasion to consider the development of civil rights and religious liberty in America. 500 Years of Protest and Liberty is composed of twenty-six articles that Miller has previously published in Liberty Magazine, Compass Magazine, Adventist Review, the scholarly publication The Journal of Church and State, along with a variety of opinion pieces that had a prior life on various blog sites. The articles have been organized into four major thematic sections. Each of the four parts is provided with a brief introduction while the whole collection is preceded by a longer general overview of the issues. A general concluding chapter adroitly ties the whole together and niftily relates the historic issues to the present day. The volume unfortunately lacks an index which could prove to be an annoyance to the serious reader although the detailed contents list compensates a little. A distinctive value of the volume is that it gathers together into a very useful and convenient compendium, Professor Miller’s scholarship previously scattered across a number of different sources. The compendium, moreover, represents a collection of easily readable scholarship because “in their former lives” the chapters were scholarly pieces written in the main for a popular audience. The discussion of important religious liberty issues thus has a freshness and practicality about them that gives them vitality because they are related to real life cases and contemporary societal developments. Part I deals with the European backgrounds of Protestant Liberty, Rights and Democracy and discusses Luther, the Reformation and the sixteenth century philosopher John Locke. Miller reminds the reader right at the start in chapter 1 that the term Protestantism arose out of the protest of the German princes at the second diet of Speyer in 1529. “Let us reject this decree,” the minority princes declared, for “in matters of conscience the majority has no power.” Miller notes the need for careful nuance in interpreting this period given the complexities that Luther and his colleagues at the time wrestled with and the priority they gave to maintaining order over freedom which resulted in terrible suffering for the Anabaptists. The members of the General Conference Unity Oversight Committee would do well to reflect on this section. The issue of women’s ordination reaches beyond a Union committee. It is a matter of conscience to constituents all over the Union. The problem will not be solved by punishing two or three Union officers. In chapters 4 and 5 the discussion moves to consideration of competing notions of human dignity in a context of national security, for example, when enhanced interrogation may be seen by some as a necessity. And, in another example, what should be considered an adequate base for achieving the correct balance between religious convictions of the individual on the one hand and the protection of the rights of those with different sexual orientation on the other? Miller is concerned that the balance has shifted too far to protect “private sexual preference and behaviors” which are given “equal, and at times superior, legal pride of place and protection in a manner that impairs the convictions and practices of religious persons” (57). One wonders whether the author’s rather deliberate choice of the term “sexual preference” rather than “orientation” in this brief allusion to LGBT issues and gay rights reflects a discomfort that is still coming to terms with the phenomenon of sexual identity. Miller’s cautious concern in these difficult questions is to achieve an appropriate balance and his discussion of the issues in the context of the 1680 debate between John Locke and Robert Filmore puts the questions in a helpful framework. On other issues, Miller appears to be hyper-allergic to anything from “the left” subtly reflected in his descriptions of such dangers as the “soft tyranny” of a “progressive, social welfare state model” which he sees as encouraging citizen dependence on the state. Miller does not seem to be nearly as allergic to a capitalism, unbridled or otherwise, that exploits laborers and the poor. Part II reviews early American experiences of Protestant liberty, the background to the separation of church and state ideology in America and the impact of the Civil War on these issues. I found the discussion of the impact of the Civil War on state-national government relationships quite illuminating. Chapter 8 argues that recent judicial activists armed with their “original intent” ideology are seeking nothing less that “a second American civil war, not of bullets and bombs, but of conservative judicial appointments, enhanced states’ rights and the promotion of strict construction.” Miller sees this as a negative development that must be opposed and rejected. In Chapter 9 Miller goes on to undertake a clearly articulated demolition of the popular “Christian Nation” ideas of David Barton identifying eight fallacies in Barton’s argument. Part III focuses on twentieth century challenges to religious freedom and is comprised of a cluster of eight articles that begin with a discussion of what Miller sees as a threat to the separation of church and state from the right coming from initiatives to encourage state funding of parochial schools. The latter part of this cluster is more concerned with perceived threats from the secular left impinging on the rights of extreme religious groups or cults and the contentious and complex issue of how to preserve civil liberties in times of national crisis when temporary suspension of individual rights might seem necessary. The wartime internment of Japanese citizens, and Jehovah’s Witnesses objections to saluting the flag serve as examples. Miller points out the danger of the degrading of rights by anxious majorities nurtured on fear, and argues that the slow erosion of respect for rights is at work in a populace before infringements occur by executive or legislative fiat. So far in American experience he points out, after the national crisis passes, infringed rights are established on a firmer basis than prior to the crisis because the contrast and contradictions seem to highlight the true value of the rights by their violation (138). The last part of the book considers a range of miscellaneous challenges in church and state relations that rear their heads in present day society and that constitute for Miller a reason for ongoing vigilance and concern. These include such matters as the law and homeschooling, limitations on the risk association with refusal of blood transfusion, state provision of tuition vouchers at parochial schools, state funding of clergy education, the legitimacy of prayer in civil ceremonies, and whether impersonal corporations can really be regarded as having religious convictions. The matter of LGBT rights and gay marriage are of particular concern. In the book’s conclusion, which attempts to draw the many disparate threads together, the author addresses the recent worrying rise of populism with its illiberal attitudes and desire for strongman rule. In spite of his clear right-leaning stance on most matters Miller courageously points this out as a very alarming trend. This concluding theme cannot help but give a sharp political edge to the book. Clearly Miller, whose natural home seems to be well to the right, is troubled by the recent political developments. What makes America great, he argues is not military clout, unfettered capitalism, xenophobic nationalism, and a return to a form of the magisterial Protestantism cherished by the religious right. These, in fact, pose a great risk to essential religious freedoms and even democracy itself. What really made America great, argues Miller, was its adoption of a constitution shaped by public policy, law, and a culture nurtured by the dissenting, free-church strand of Protestantism that placed high value on protecting the rights of religious and ethnic minorities. When society allows the rise of demagogues who play on the fears and insecurities of the populace a descent into tyranny surely follows. In this context, Miller revisits Plato’s third century B.C. question as to whether the proliferation of equalities in a society constitute, in fact, democracy’s fatal flaw which makes it finally unable to sustain itself. Does the recent extension of equality to everyone, such as in gay rights, mean that America is experiencing a “late-stage democracy?” In this context Miller eventually gets to the potential coerced worship problem. He still does not tie the threat specifically to Sunday laws, although his reference to Revelation 13 seems a clear allusion. America’s true founding principles need a rebirth he suggests. The factors that made Pennsylvania a successful model for the United States constitution and an appropriate location for the writing of the historic document need reviving. They were not business acumen or industrial might but a commitment to principles of open and accountable government, an evenhanded and independent judiciary and a principled embrace of religious and ethnic diversity” (191). 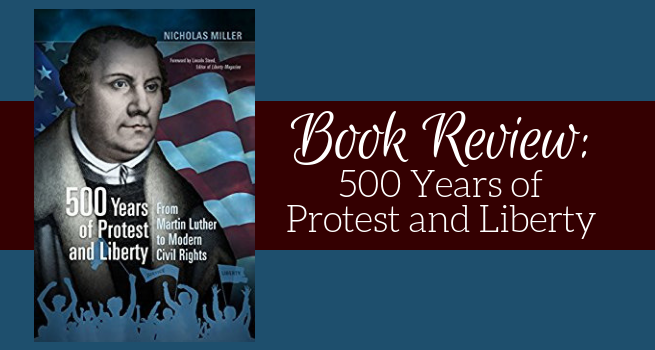 500 Years of Protest and Liberty receives some enthusiastic endorsements from a number of Professor Miller’s associates in the religious liberty field who have appreciated the breadth of Miller’s concerns and the depth of historical background and understanding that he brings to his task. David Little, formerly of Harvard Divinity School, acknowledges that while the subject that Miller deals with is currently highly divisive, Miller nevertheless “gives careful and informed consideration” to the themes even if one may not agree with everything that is said. Some readers at least, will agree with Professor Little and find cause to disagree with Miller’s take on a number of issues. Some will observe that while the author labors to present his political or civic perspectives as moderately balanced between what is desirable and what is undesirable, his vision seems to be impeded by serious blind spots. He appears to view the contemporary landscape as an exclusively bipolar habitat divided between a religious right and a secular left. His claim to centrism appears to be a defense of a position well surrounded on all sides by the right. In this book anything that is identified as “left” is somehow perceived as a serious threat and is almost always associated with the term “secular” if not with communism or socialism. There seems to be no legitimate place in the author’s world for a principled religious left, for individuals and church communities convicted that social justice is an integral part of the teaching of Jesus and that working with the state to achieve such justice is not inappropriate. One suspects that this right-leaning perspective reflects an Adventism more comfortable launching sporadic, ad hoc massive charitable health fairs to treat the poor than modifying an obsession with hyper-individualism enough to create a public health system that will provide universal health care equitably for all on a predictable and reliable basis without generating dependence. But Adventism has always seemed to have this problem. As Harry Leonard once observed about the very slow start early Adventism experienced in England: Adventism “from its earliest days has had it greatest impact upon men of at least some property.” It found itself almost impotent when “confronted by those who had none.”1 A discomfort with, and an inability to identify with the poor and the working masses has frequently been seen as a hindrance to its growth and mission. It is also probably to be expected that the preoccupation of the volume is with the United States and its distinctive political system even though the book begins by citing a Maori proverb seen on a mountainside in Queenstown, New Zealand that suggests a universal truth: “within our history is our future well-being” (14). The preoccupation exclusively with the United States has its limits. Religious liberty issues and church-state relationships in other cultural and national settings may clearly find a different balance that is just as legitimate when it comes to the resolution of specific issues such as the funding of private and parochial education with tax payer dollars as is practiced by Adventism in some countries of the South Pacific, for example. The role of government in Adventist Higher Education in parts of Asia, for example, is able to be accommodated and the role of prayer in the public arena in many places is not as sensitive an issue as it is in the U.S. In spite of its blind spots, however, 500 years of Protest and Liberty is well worth reading. As Cole Durham of Brigham Young University noted, Professor Miller’s “deftly selected vignettes” capture significant high points in the unfolding quest to develop and preserve religious liberty. The book thus makes an informative contribution to the conversation on religious liberty and bravely raises important and urgent questions about the populist direction of the present administration and the implications for religious liberty in America’s future. 1. H. Leonard, “Andrews and the Mission to Britain,” in J. N. Andrews: The Man and the Mission, ed Harry Leonard, (Berrien Springs, MI, Andrews University Press, 1985), p. 251. Gilbert M. Valentine lives and writes in Riverside, California. He is author of a scholarly biography on W. W. Prescott (2005), a history of the White Estate titled The Struggle for the Prophetic Heritage (2006), a study of the political influence of Ellen White in The Prophet and the Presidents (2011), and coedited, with Woodrow Whidden, a Festschrift for George Knight entitled Adventist Maverick (2014). Image courtesy of Pacific Press Publishing.